The name "Plumeria" is attributed to Charles Plumier, a 17th Century French botanist who described several tropical species. However, in 1522 the plant was already described by Francisco de Mendoza, a Spanish priest. 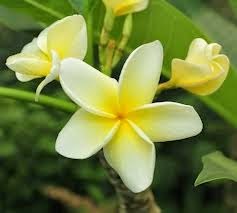 The name, "frangipani" comes from the Italian nobleman, Marquis Frangipani, who created a perfume used to scent gloves in the 16th century. The scent of the frangipani flower reminded people of the scented gloves, thus the flower was called frangipani. The name can also be derived from the French frangipanier which is a type of coagulated milk looking like (the poisonous) Plumeria milk. 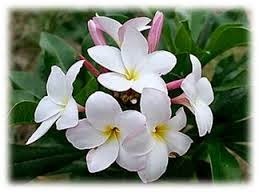 Plumeria or Frangipani is a small genus of 7-8 species native to tropical and subtropical Americas. From Mexico and Central America, Plumeria has spread to all tropical areas of the world, especially Hawaii. Plumeria species have differently shaped leaves and their form and growth habits are also distinct. The sweet scent and sheer beauty of the frangipani (Plumeria) make them universally loved, both as a tree and as a cut flower. The white and yellow species are more familiar, but they come in varied colours of tropical and sunset – the closer to the equator, the more colourful. with a wonderful perfume. 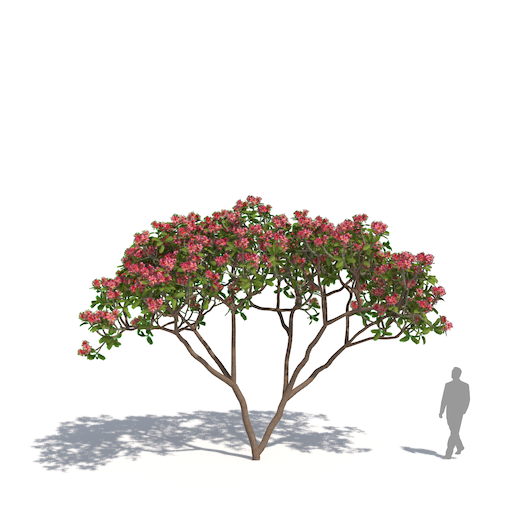 The small trees only grow to about 5-6m in height, but often have wide branches. Their well-behaved root system makes them suitable for the garden (any soil type will do) and for growing in pots, but it needs to be well drained. They grow in all climates (except when there is severe frost) but prefer a hot, dry climate. The deciduous tree allows maximum winter sun while providing shade in summer. With its gnarled branches, long leaves and distinctive flowers, the frangipani is easily one of the most common and identifiable trees. The bark is grey/green and scaly in appearance. Related to the Oleander, the milky, sticky sap is poisonous to both humans and animals. lure sphinx moths to pollinate them. As the flowers have no nectar, they simply dupe their pollinators who transfer the pollen from flower to flower in their fruitless search for nectar. with the centre of the flower a different colour to the rest. 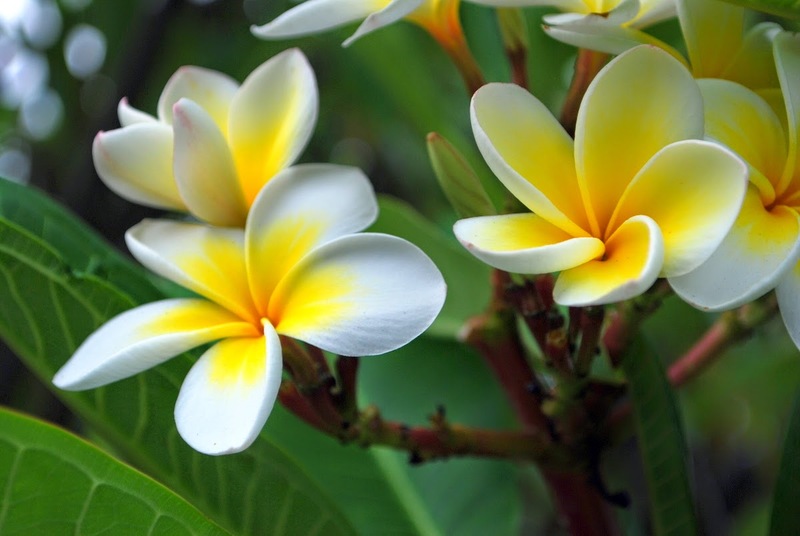 The most common frangipani has white flowers with a yellow centre, but they can vary from deep crimson to orange, yellow and white (and every shade in between). In general, flowers appear from December to April and even longer in warmer climates. 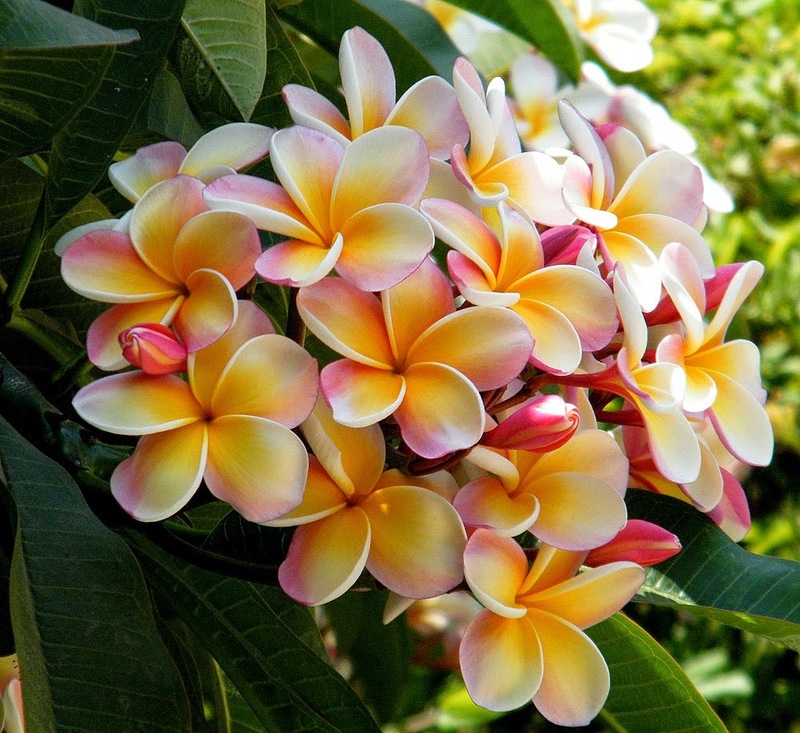 • Many Hawaiian leis are made from frangipani (Plumeria) flowers. • The colorful caterpillar of Pseudosphinx tetrio feeds only on the leaves of Plumeria rubra. • Frangipanis are good hosts for dendrobium orchids. • The frangipani is the national tree of Laos, where it is called dok jampa. Regarded as a sacred tree in Laos, Buddhist Temples have many trees that are hundreds of years old. These are spectacular, huge, gnarled giants. • The frangipani is the flower of the city of Palermo in Sicily, Italy. • The frangipani is the national flower of Nicaragua and it features on some of their bank notes. 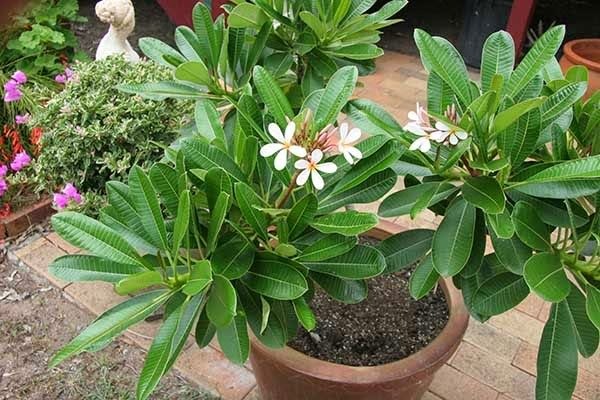 • Frangipanis won’t burn except in extreme (over 500 degrees) temperatures. • In Caribbean cultures the leaves are used as poultices (a healing wrap) for bruises and ulcers and the latex is used as a liniment for rheumatism. • In India the frangipani is a symbol of immortality because of its ability to produce leaves and flowers even after it has been lifted out of the soil. Often planted near temples and graveyards, where the fresh flowers fall daily upon the tombs. 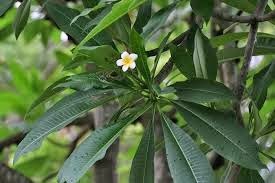 • In Vietnam the frangipani is used for its healing qualities: the bark, mashed in alcohol, prevents skin inflammation, it is also used to treat indigestion and high blood pressure, while the roots have purgative effects on animals and the milk-like sap serves as a balm for skin diseases. The white flowers are used in traditional medicine to cure high blood pressure, hemophilia, cough, dysentery and fever. 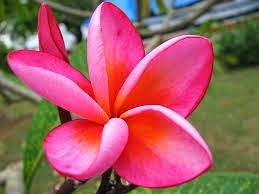 • Frangipani (Plumeria) is very rare in China, and even more precious than orchids. So, when a person gives frangipani flowers to a sweetheart, it is the closest thing to saying you're special, I love you in a culture where expression of personal feelings is frowned upon. Plumeria Rubra is the most common plant which comes in many colours: from white to cream to yellow, even oranges, pinks (both pale and hot pink), reds and even deep cerise. Rubra has the most fragrant flowers – always 5 oval shaped, medium sized petals. have a pointed end and drop when winter approaches. This tree can grow to 5m tall and almost as wide.